Building a community of soccer coaches to better ourselves through collaboration and shared wisdom. Just returned from my first residential course assignment as Associate Staff for the NSCAA. It was a great experience and I’m excited to be on this journey of developing myself as a coach of coaches. I’ve been on state staff for Federation courses now for five years, but it’s been a great experience to see the other side of the NSCAA. For the my first course as staff I “apprenticed” with the senior staff. Basically shadowed a few instructors in the National Diploma and Advanced National Diploma courses, watched how they conducted model sessions, and I was a part of the candidate evaluation process too. The differences in the philosophy and mentality of coaching education is drastically different in my mind between the NSCAA and the Federation. Maybe it’s more fresh in my mind since I only completed my “A” license this past January, but the emphasis on development versus evaluation is very apparent, and I even experienced it as an instructor in training. It’s always been something I’ve really enjoyed about the NSCAA, they want you to go home a better coach because you’ve been at their course, no matter what grade you end up with. During the National Diploma course the four instructors were always available to the candidates for help. We ate in the cafeteria, we stayed in the same dorm, the staff were regularly walking through the lounges to make themselves available to the candidates, and even the course social the second evening sets the tone for the remainder of the course. It’s a community of coaches, and the more experienced ones are trying to share knowledge with the less experienced, and one another. It’s a coaching fraternity, and once you’re in, you’re in, and you have just as much right to the information and feedback as anyone else. I felt all of this as an apprentice this past week as well. Senior staff were asking for my input on model sessions they were running, asked for insight on candidate training sessions to make sure they were evaluating properly, and treated me as a member of the instruction staff from the get-go. It reaffirmed the reason why I feel passionate about educating coaches, especially with the NSCAA. Just returned Sunday evening from the 2013 ODP Region 2 Camp. I had the privilege of coaching the ’98 Dakota Boy’s team again this year. As I mentioned last year, it’s always hard being a Dakotas team and showing up at Region Camp with only half the team ever even meeting one another. This year we had eight players from the Dakotas, and we picked up seven composite players from Wisconsin and Illinois. The boys enjoyed playing with each other, and it was a positive experience for the most part, but the soccer was lacking. Fortunately we had two players that made the holdover pool of 36! Very proud of these two guys, especially since I’ve been coaching them for a couple of years and it’s nice to see them reaping some rewards for their efforts. And most importantly, I hope the experience of training with the best 36 players from Region Camp makes them a better player and shows them what the next level will be like. Proud of the effort the whole team gave at camp, and for coming together and having moments of quality soccer. This past week I spent eight days on a missions trip to the island of Dominica. I was blessed enough to be able and use my talents as a soccer coach to try and serve a developing country. What a blessing to work with a people who love the game of soccer, and appreciate what little they have. 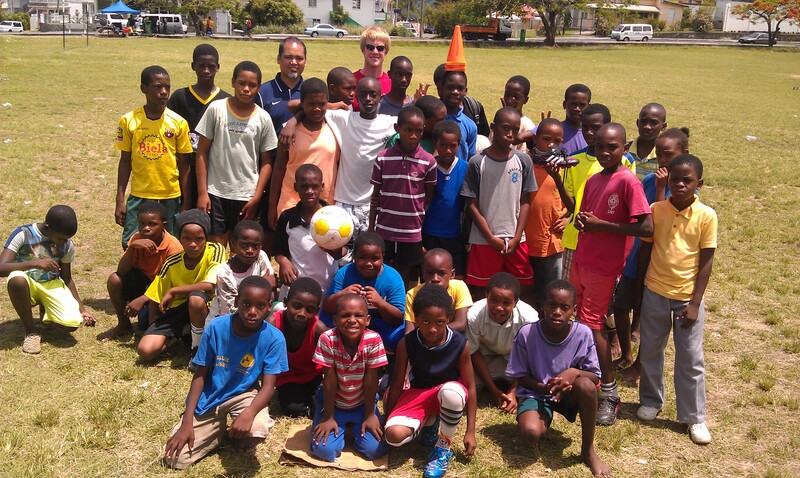 The trip was a partnership between Generation of Opportunities and Athletes in Action to bring seven coaches down to the island of Dominica. We brought coaches from four different disciplines (soccer, basketball, fitness, and volleyball/ chaplain) and conducted player clinics and coaches sessions throughout the week. This was the first trip of it’s kind to Dominica, so the trip was also as much discovery as it was action. We met with several officials and administrators from the presidents of the basketball and football associations, to principles, city officials, and administrators of soccer academies. I was personally impacted by the love of soccer they had. Kids were taking buses from villages almost an hour away to attend their academy training on Saturday in the city. Children with out proper footwear and clothing would jump in because they just enjoyed the game and wanted to be apart of it. In a country with a total population of 70,000 people they had four competitive divisions of soccer plus neighborhood leagues and eight academies for the children to be involved in! They love this sport, and they are passionate about playing it. But there is a need for intervention. The one repeating theme we kept hearing over and over again from coaches and administrators alike was the battle to teach the youth of their country the value of discipline, hard work, and respect. There is a need for this younger generation to learn principles that will lead to success later in life, and Generation of Opportunities is trying to help change that through the platform of sport. The trip has given me a passion to see the culture of the youth in Dominica change, and if I can use soccer to do that then all the better! God was opening doors left and right for us to be involved in the lives of the young and old alike through this beautiful game, and I’m looking forward to going back! How Important is Team Chemistry? As I wrapped up individual meetings in the fall I started to notice a trend; team chemistry was a highlight of the year for most of our players. This past season was disappointing from a results point of view, we finished on a high note with our last five regular season games, but we didn’t hit the goals we had set coming into 2012. So I was a little surprised when a majority of the freshmen stated that this was one of their favorite seasons to date in their careers, and a majority of the returners felt better about team chemistry compared to last year. I would have to agree with them, 2011 was a fantastic year in the record books for Tiger soccer, but team chemistry was not where we wanted it and the result was a mass exodus of the freshmen class. So it leaves us begging the question how important is team chemistry to on-field success? In 2011 the team had several problems with team chemistry on and off the field. The new student-athletes didn’t feel they were welcomed and the upperclassmen didn’t feel like the new additions were good for the team. However, in 2011 we were very successful on the field and our success translated to several program records being broken. Coaches always talk about how important team chemistry is to athletic success. But the results of the past two seasons have started to bring this philosophy into question for me. My coaching philosophy has always been built around the importance of team chemistry. Our team culture tries to emulate a family atmosphere, where opinions of teammates are valued and we look out for each other on and off the field. Team unity and developing a family environment have been a corner stone of every program I’ve had the privilege of coaching. Ultimately, talent wins games, but attitude can be the difference maker (to quote Jon Maxwell). All things being equal, if the team in 2011 had been able to get along better we might have had even more success and been able to achieve even more. If the team in 2012 could of had more talent or been in better form we might have over achieved. Not ready to throw out the cornerstone of every program I’ve run, but there are lessons to learn from the past two years. Ultimately though my coaching philosophy revolves around developing an experience for the student-athletes that helps them to grow as men and women, and the focus is more on them than the results. I want to be successful and win games as much as the next guy, but in the end it’s the relationships that our students have developed and their memories that will be the legacy of the program. This time of year I’m used to seeing a lot of coaches moving in and out of jobs. In recent years the turnover has been less and less as coaches are hanging onto the jobs that they value in an uncertain economy. And every spring I stand by and watch graduate assistant coaches struggle to find the next step for their careers. Some have been fortunate and had the right doors open up for them, others I have to watch try and try and resign themselves to another career path. It seems to me that the job market for soccer coaches has become extremely tough though in recent years. One that is becoming very hard for entry level coaches to find their way up in a crowded job market. With the recent hiring of Ryan Nelson at Toronto FC this past winter there seems to be a lot of questions about what young coaches need to do to break into the market. Here was a player who had zero years of coaching experience, no coaching education to speak of, and spent zero hours getting acclimated to the league before diving in. Then we watch a coach like Caleb Porter who came through the USA college system, played in the MLS for a couple of years, spent time as an assistant college coach, and then made a name for himself at Akron. He worked his way through the USSF coaching license structure, ODP and U-23 National team coaching ranks, and finally landed a head job at the professional level. Martin Rennie is another great example of a coach who worked his way up from a Premier Development League team, to the United Soccer Leagues, he made a stop in the North American Soccer League, and finally to the MLS. He has his UEFA coaching badges and progressed as a coach through the ranks as he proved himself. So what can my graduate assistant coaches, and many young coaches, take from these examples? As the old expression goes, “there’s more than one way to skin a cat.” There isn’t a right answer, and it probably comes down to the individual creating and preparing for the right circumstance to arrive. John Wooden has been credited with saying, “Luck is when preparation and opportunity intersect.” People need to be ready, they need to be working and preparing themselves, because someday that opportunity will present itself. The only question is will the individual be ready to rise to the occasion and grasp what is in front of them. Some very qualified people are being overlooked for positions, and some very under-qualified coaches are being hired. Ultimately it comes down to what you do. There is no “right” answer, or magic formula, that will work for everyone. It can be frustrating to watch, and it can be even more pain staking to endure. In the end though I have to believe that the men and women who really feel led or called to be in this profession will find a way to coach and make an impact in this country for the beautiful game. Content is starting to get pretty thin from a schedule stand point, but the instructor’s feedback and candidate comments are just as good as any coaching seminar I’ve ever attended. The day kicked off with two field sessions led by Mark Berson. The first was addressing possession through the thirds of the field. I enjoyed how he handled this topic and used small restrictions to help the U18 IMG Academy boys recognize that short, quick possession is used to gain ground up the field towards an end goal. I’ve seen a lot of teams who possess the ball for the sake of possession with no apparent purpose in mind, and Berson’s session always kept the end objective of scoring a goal in mind. He followed up this session with a training on flank play. Fairly standard session, but the coaching points were solid and they players improved their flank play. The rest of the day was spent on practice coaching sessions. Every day I grow to have a deeper respect for the depth of knowledge that Tom Durkin has of the game. I know I must sound like a broken record, but the attention to detail, and his recognition of the small things that make a big difference is remarkable. Listening to his critique of the candidates during and at the end of sessions is a coaching clinic in itself. Rough day physically, we’ve been blessed to have IMG kids available for every session but for the afternoon we had approximately three girls available. We were spoiled leading up to this point only needing three of four coaches per training session, and for this afternoon you could notice an immediate drop in intensity level as every practice session passed and old legs got heavy. I really do enjoy playing and contributing, but I also recognize that I’m not in the best form I could be to help the other candidates out. Tomorrow we begin with practice coaching again, with one lecture to finish out the morning, and then it is practice coaching all afternoon. On the third day we were introduced to Ruud Dokter for our first session in the morning. For a course that is filled with bright spots, Ruud has been the highlight of the course for me to this point, and not just because of the information that he shared in his session. Ruud was most recently the Dutch National U16 Boy’s Head Coach, he was the National Women’s Head Coach from 1995-2001, and is currently very involved with the KNVB coaches training program as well as helping to consult the USSF on our coaching curriculum and methodology. Ruud led a field session on counter attacking and finishing. Very simple build up with a long grid and players trying to win the ball deep in their defensive half and finding the target to build counter. There were some technical break downs with the U18 boys team we were using, but his coach demeanor was fantastic. He did a great job relaying the information that was pertinent and made the topic work for the players that he had in front of him. I’ve seen several instructors get frustrated with the level of demo players, but this is coaching; communicating and relaying an idea about the game to players, no matter what level they are at. That is the mark of a good coach, not that he can teach the good players how to play, but that he/she can develop the players that are in front of them as they are. Tom Durkin followed up this field session with another addressing defenders playing out of the back third. Tom’s coaching style is fantastic to learn from! He is unwavering about what he wants out of the players and their attention to the small things. Even though he demands so much from the players, his energy and demeanor communicate that he wants them to succeed and he celebrates their success. His communication style and ability to transfer the ideas in his head to the players, and WHY, reached the kids and we saw marked improvement in the topic. The technical level of the U16 team he was working with was drastically different than the previous team, and it was very apparent that Tom was frustrated with the level of play, but he was very patient and stayed on task through the entire session. Then we went inside for a lecture on counter attacking presented by Jeff. Here is why I’m enjoying Ruud so much; in the front row, notepad out and taking notes the entire time, was Ruud Dockter. He is definitely the most senior, and most experienced clinician at the course, however he sits in the front row and takes notes constantly when he is not instructing. In the afternoon we had two field sessions; training the midfield and forwards in the attack (Mark Berson), and analyzing the 1-3-5-2 v. the 1-4-3-3 (Tom Durkin). We had the U18 girls to work with, and they were the worse technical group to point. It was a struggle for the clinicians to get their topics covered, but both did a great job being patient with the ladies and improving their level of play related to the topic. In the evening with met with our evaluating instructors and did a review in groups of four over our match analysis of the USA v. Guatemala. Our technical reports were handed back to us and we covered the things that were deficient and what we needed to improve on before our oral exams. The day started right at 8am with a field session on Deep Defending by Jeff Pill. The way the course is set up is very different from the Premier Course (which is great for me to get a weeks worth of new information) in that the topics are geared towards styles and tactics used in an 11v11 match. The Premier Diploma focuses on systems and styles of play commonly used within those systems (which I also thoroughly enjoyed learning) taught by four coaches who are currently, or were using those systems with the teams they coached on a regular basis. The “A” license is looking at systems of play, but is primarily focused on tactics used by coaches in full sided games such as deep defending, high pressure, flank play, counter attacking, or build up play. The other theme that I’m starting to catch on to at the course is the emphasis given to answering the “5 W’s” when analyzing the game of soccer; Who, What, Where, When, and Why? Jeff presented his topic of deep defending by addressing these “5 W’s” during his model session. The build up lead to a full-sided game on the full field. The second field session of the morning was the 1-4-4-2 v. a 1-4-5-1 presented by Tom Durkin, and the tactical elements we need to consider in the attack and in defending. Issues like defending the the extra man, attacking weaknesses, and strengths and weaknesses of the two systems were demonstrated in a full 11v11 match. Jeff followed up his field session with a classroom lecture on the principles he covered in the field session. In the afternoon we had the privilege of having Peter Mellor (former English professional with Fulham and Portsmouth) and one of our course candidates, Paul Rogers (current USWNT goalkeepers coach) conduct a classroom lecture and field session on goal keeping in a team system. Key coaching points were the importance of organizing team shape and initiating the teams transition into attack. Finally in the evening Tom Durkin conducted a classroom lecture on the elements required for a team to regain possession early by pressing. By this session I’ve started to have a growing respect for the attention to detail, and the demand of a high standard, that Tom places on his players. He demands a high level of attention to the small things that will make a team better, and it has been a great experience for me to listen to Tom talk about, and teach, the game of soccer. There are things I find to be a little over the top about his coaching style and method, but you have to respect that standard he demands from his players, and the purposeful teaching method he uses for attention to details. We were eliminated in the first round of the conference tournament; and the game was a great representation of how the season went as a whole for us. The first half was a lot of fun. We competed and played really tough together as a team and held the top seed to a 0-0 score line by the half time whistle, but unfortunately the second half was a total 180 degree turn from the first half. We made major mistakes around the goal that resulted in two goals allowed off of set pieces, we didn’t stay focused and allowed things that were outside of our control to distract us, and we went away from our style of soccer and build up. As a result we gave up three goals in the second half and really didn’t give ourselves a chance to compete in the second period. It was very gratifying to watch the guys compete in the first half, and even though I have to concede that the better team won, it was disappointing to watch our level of play drop so drastically in the second half. And the toughest part of the night was saying good-bye to my first recruiting class here at DWU. All six seniors hold a special place in my heart, and it was very difficult to go through that line and see each of them crying at the end of their career. We finished the season strong, which is always a coaches objective, but overall I leave 2012 with a lot of questions about how we could have done more to reach our potential. Felt this team had a lot more to give, and as a coach I was unable to get that out of them and help them reach their potential. More to come later. Season evaluations will be conducted tomorrow, and individual meetings will be conducted this week. Hopefully it’ll give us a better idea of what we could have done better with the talent we had. How Much Have We Improved?